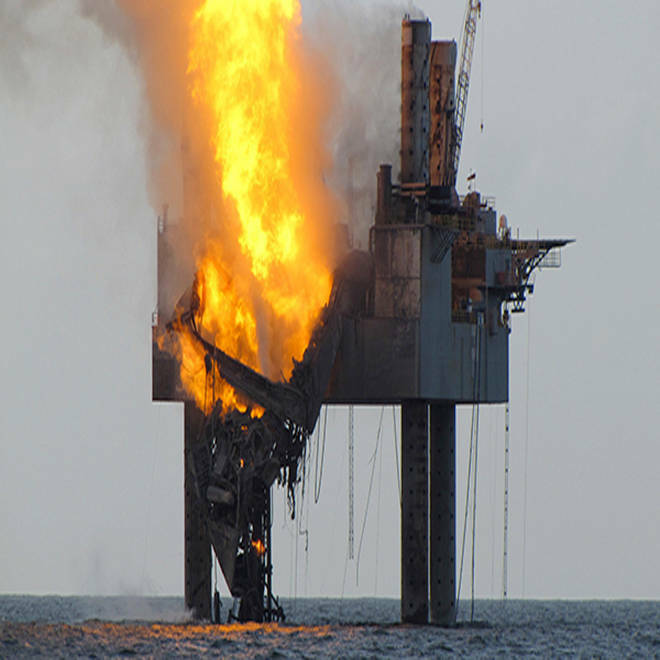 Hercules 265 rig fire that caused a collapse of the drill floor and derrick after an explosion on Tuesday in the Gulf of Mexico. A Gulf of Mexico drilling rig partially collapsed off the coast of Louisiana after catching fire because of a ruptured natural gas well, U.S. regulators said on Wednesday. The blaze broke out after a blowout on the Hercules 265 natural gas platform at around 10:45 p.m. local time Monday. Eileen Angelico, a spokeswoman for the Bureau of Safety and Environmental Enforcement, said no one was on board when the fire started and it was not known what sparked it. She said an investigation into the cause of incident was "well under way." A Coast Guard spokesman in New Orleans said Thursday that sediment and sand had flowed into the well and the flow of gas had stopped. Petty Officer Ryan Tippets said overflights showed the fire had been reduced to a small flame fueled by residual gas at the top of the well. The 44-strong crew who were evacuated on two lifeboats, after the gas began spewing to the surface, will be interviewed about how they lost control of the well, Angelico added. None of them were injured, NBC station WDSU reported. The beams supporting the derrick and portable drilling rig floor have folded and have collapsed over the rig structure, operated by Hercules Offshore. Under bureau direction, Walter Oil & Gas Corp has begun preparations to move a jack-up rig on location to drill a relief well, the BSSE said in a statement. Both BSEE and Coast Guard Surveyed the fire from the air this morning to assess the situation. A "very light sheen that dissipates quickly" was seen in the ocean near the rig, according to a BSEE/Coast Guard statement.. It appears that there are few environmental dangers evident in the collapse of a natural gas platform that is burning to the waterline more than 50 miles off the coast of Louisiana. NBC's Brian Williams reports. Experts from Wild Well Control, who specialize in tackling rig fires are also being consulted on the best way to fight the fire. Walter Oil & Gas reported to the BSEE that the rig was completing a "sidetrack well" — a means of re-entering the original well bore, Angelico said earlier. Sidetrack wells are sometimes drilled to remedy a problem with the existing well bore. "It's a way to overcome an engineering problem with the original well," Ken Medlock, an energy expert at Rice University's Baker Institute told the Associated Press. "They're not drilled all the time, but it's not new." In 2010, the Deepwater Horizon oil rig exploded off the Louisiana coast, killing 11 workers and eventually spewing millions of gallons of oil into the Gulf of Mexico. A natural gas well off the Louisiana coast caught fire, hours after a blowout that prompted the evacuation of 44 workers.